Just this past week I took a road trip with my family to the midwest. We enjoyed the drive and seeing the sights, but never far from my mind was how isolated we sometimes were. On a few of the state highways – one lane in either direction, flat, and no structures for miles upon miles – I realized that it would be bad to break down without having prepared beforehand. As a result, I began to mentally take stock of what we had available in our vehicle and how long we could survive on it. Of course, some of what I inventoried in my mind was what weapons we had to defend ourselves with, and what communications tools we had to contact help. The following is a list of equipment that I try to maintain in my vehicle for such a trip and some justification for each piece. Now, being a family guy, there’s always a cooler in the vehicle when we travel. On this particular trip we were in my wife’s truck (a Dodge 1500 RAM Quad-cab with a cover on the bed). The cooler was properly filled with water, sodas and some veggies for snack food. The ice was from our freezer because, knowing we were going on a road trip, we stockpiled some out of the ice-maker. That ice is made from filtered water and that means we can drink it when it melts – another source for water. The veggies weren’t the only potential food supply. Seeing as how I have children, and several of them being teenagers who eat like food is free, there is always a supply of snack bars. The family preference is for Nature’s Valley variety of crunchy bars. Usually these are some mixture of oats flavored with things like maple, brown sugar, apples and cinnamon. Each package contains two bars, but that’s not enough really to qualify as a meal under normal conditions. However, as emergency rations, each package of two bars could be sufficient to keep you going for several hours. So, that’s food and drink. What else? Shelter? We had the covered truck bed and I have an old poncho under one of the seats. Along with that poncho is a set of aluminum tent stakes and some bungee cords. I can make an emergency shelter from sun / rain pretty quickly. With some creative thinking and the benefit of the bungee cords, I’ve even come up with a way to attach the poncho to one side of the truck and stretch it out so that the truck and poncho are used together to form the shelter. It may not be all the comforts of home, but it’s shaded (which might matter during heat waves like the one most of us are experiencing now) and it’d be dry. Communications was my next big issue. I don’t have a Citizens’ Band radio in either of my vehicles, but the trip made me think about getting one. Even if it’s only a portable CB (as compared to one mounted in the vehicle), it’d be a good idea. As it was, my wife, oldest son and I all had our cell phones. We had the ability to recharge the phones via the truck, so we had communications IF we had signal strength. Anyone with a cell phone knows that there are dead spots where no signal exists. In the farther stretches of the central plains and midwest, those dead spots can get pretty big. I’ve always just assumed I could walk to where I had signal – and that’s true if I’m anywhere near home. The dead spots here are few and far between and usually don’t stretch more than a mile or two at the most. In one section of Iowa, we drove for about twenty miles with no signal. 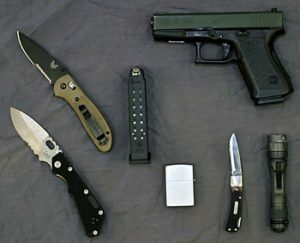 – My Glock 19 9mm pistol with one spare G17 magazine. That gave me 33 rounds of 9mm ammo. – Whatever impact weapons we could get out of the truck, i.e. jack handle, etc. As a police officer, and thanks to the Law Enforcement Officers’ Safety Act, I can legally carry that handgun on my road trips. You may not have that luxury. Take stock of what you do and don’t have. What’s legal? 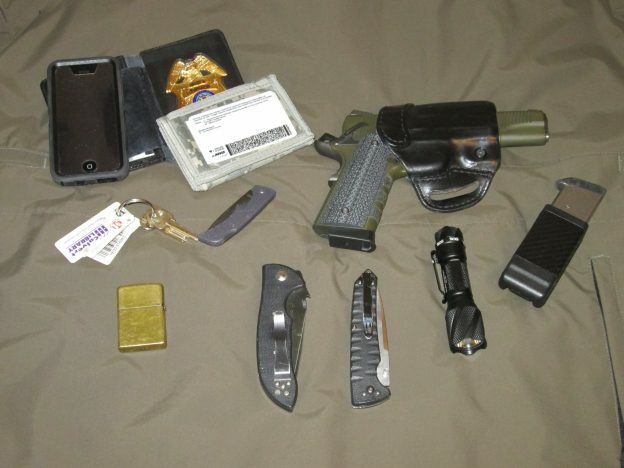 What can you carry that wouldn’t arouse suspicion but that you could use as an improvised weapon? During the colder months, I add a couple of spare sleeping bags to what’s normally in the trunk. Depending on weather forecasts I also put in a shovel and several bags of ice melt and/or sand. I always keep two emergency “space” blankets in the truck’s storage console. If I had to make a fire, my son and I both had lighters in our pockets and the truck’s emergency kit has several flares. I think we could have managed. This entry was posted in Gear & Stuff, Other Reading and tagged borelli, equipment, Frank, road, safety, travel, trip on April 25, 2018 by Frank Borelli.